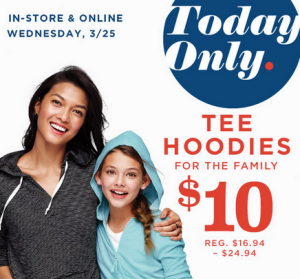 Today only, shop Old Navy to score Old Navy Tee Hoodies for the entire family for just $10 – regularly $16.94-$24.94! This sale applies to select styles only and there is a limit of 5 per customer. Shipping is free on orders of $50+ or when you buy at least one item from Piperlime. Plus, be sure to browse all Dresses & Skirts on sale for up to 40% off and Men's and Boy's Shorts and Button-Downs are on sale for up to 40% off! And through March 26th, save an additional 35% off all purchases at Old Navy.com – no promo code needed! Lastly, through April 5th, earn $10 in Super Cash for every $25 spent in-store and online!